Well it’s here (almost) at last – the Apple Smart Watch, so why am I not jumping for joy. Probably as for me, not having an iPhone 5 or later, the Smart Phone won’t work. And if I had and it did, I still can’t access the Apple Pay idea and use touch-less payment, not here in the UK anyway – and don’t hold your breath. And that’s not all, I also can’t have the touted GPS function, receive phone calls or transmit messages, though sticking my hand (on the end of my wrist – so pretty close) in my pocket, I can do all of these with my present non iPhone, phone. 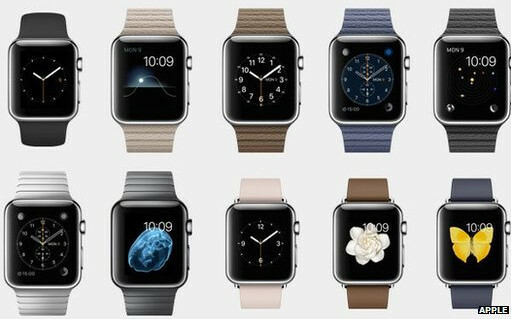 Apple Smart Watch – in 38 versions! So not being too impressed with one Apple Smart, how do I feel with, wait for it – 38 versions! Yes there are . . . .
And as with all so called “Smart” watches, not just Apple, the battery life is still a big disappointment. They quote supposedly 18 hours with a 2.5 hr charge time, so at best it might manage a day, but utterly depending on how many Apps (there’s going to be dozens of these!) and messages you fritter away your time with – assuming you’re an iPhone 5 or better user. Apps for everyone – but only if you’ve also got an iPhone 5 or later! It’s said that if you switch OFF all other functions then the watch will still display the Time for up to 72 hours. Well Hello! My old Casio can do that for 10 years without a battery change and my oldest mechanical Automatic can manage it for – ever? Well as near as damn it. 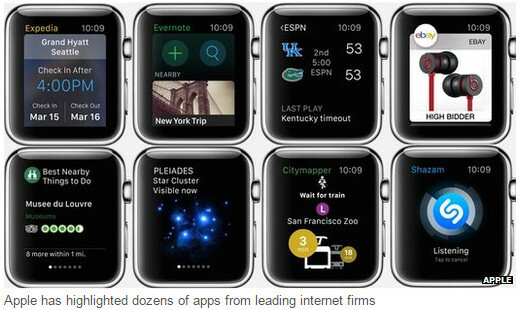 So the Apple Watch Time for 72 hours seems irrelevant to me. Also the prices in my opinion are just too high – I mean just think what I can buy, watch wise, with the starting price of the Apple – £479 in the UK or next model at £949 – Wow I can think of a few! The trouble with this Smart stuff is that whatever the App on your wrist, just a foot away in your pocket is your phone, which does the same, does it better AND the battery lasts longer. What’s the difference that I can call up a Uber Taxi from my wrist or from my Phone? I can’t see any time benefit, physical benefit or cost benefit – and in the case of the latter, quite the reverse!